1. Tomatoes are good for your skin. 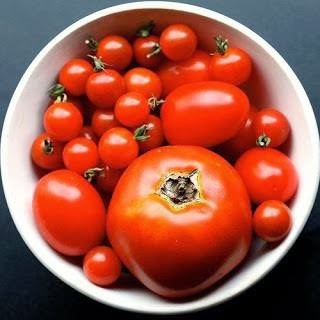 If you want to try tomatoes for skin care, you need to start with about eight to twelve tomatoes. Peel the tomatoes and then place the skin on your face with inside of the tomato touching your skin. Leave the tomatoes on your face for a minimum of ten minutes, then wash. Your face will feel clean and shiny. Some redness may occur, but should fade with time. 2. Tomatoes help prevent several types of cancer. 3. Tomatoes help maintain strong bones. 4. Tomatoes help repair damage caused by smoking. No, eating tomatoes is not the most recent fad to help you quit smoking. However, tomatoes can reduce the amount of damaged done to your body by smoking cigarettes. Tomatoes contain coumaric acid and chlorogenic acid that work to protect the body from carcinogens that are produced from cigarette smoke. 5. Tomatoes provide essential antioxidants. Free radicals in the blood stream are dangerous because it may lead to cell damage. Remember, the redder the tomato you eat is, the more beta-carotene it contains. In addition, you also want to keep in mind that cooking destroys the Vitamin C, so for these benefits, the tomatoes need to be eaten raw. 6. Tomatoes are good for your heart. Because of the Vitamin B and potassium in tomatoes, they are effective in reducing cholesterol levels and lowering blood pressure. Therefore, by including tomatoes in your regular balanced diet you can effectively prevent heart attacks, strokes as well as many other heart related problems that may threaten your life. 7. Tomatoes are good for your hair. The Vitamin A in tomatoes works perfectly to keep your hair shiny and strong. In addition, it also does wonders for your eyes, skin, bones and teeth. 8. Tomatoes are good for your kidneys. 9. Tomatoes are good for your eyes. The Vitamin A found in tomatoes is fantastic for improving your vision. In addition, eating tomatoes is one of the best foods to eat to prevent the development of night blindness. 10. Tomatoes are good for diabetics. Tomatoes are packed full of the valuable mineral known as chromium. It works effectively to help diabetics keep their blood sugar levels under better control.